New Delhi : Cricketer-turned-politician Navjot Singh Sidhu, who has recently resigned from Rajya Sabha, has joined hands with former SAD legislator Pargat Singh to give birth to a brand new political outfit Awaaz-e-Punjab, ahead of assembly elections next year. # Amid the buzz of Navjot Singh Sidhu joining AAP, he forged an alliance with Pargat Singh. The move comes with a likely motive to take on SAD-BJP combine, Congress and AAP in upcoming assembly elections in 2017. # Apart from Sidhu and Singh, a hockey player-turned-MLA who was suspended by the state’s ruling Shiromani Akali Dal, Ludhiana-based independent MLAs and brothers Simarjeet Singh Bains and Balwinder Singh Bains will be in the new front. # Pargat shared a poster after the leaders met in the national capital. 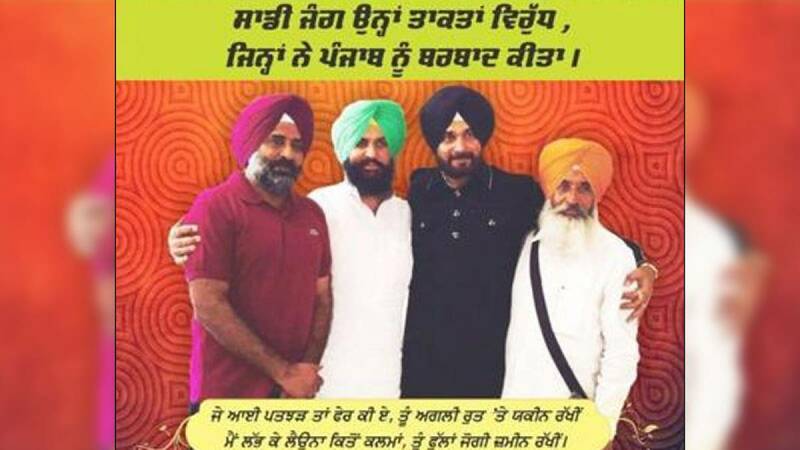 # Sidhu’s wife and Amritsar BJP MLA, Navjot Kaur Sidhu, too posted on Facebook a similar poster saying ‘Save Punjab’. # Navjot Singh Sidhu had quit from Rajya Sabha on the first day of the Parliament's monsoon session over a dispute with the BJP leadership. # “We have learned that Sidhu has formed a political front. It is up to him to comment whether they will launch a party or not,” AAP’s Punjab state in-charge Sanjay Singh said.